Swara Bhaskar is an Indian actress who appears in Hindi films. She rose to prominence through her supporting role of Payal Sinha Singh in the 2011 commercially successful romantic comedy Tanu Weds Manu. She also starred in the 2013 critically acclaimed romantic drama Raanjhanaa, and played Rajkumari Chandrika in the 2015 romantic drama film Prem Ratan Dhan Payo. For her work in Raanjhanaa, she won a Screen Award and a Zee Cine Award for Best Supporting Actress. Her other movie credits include Nil Battey Sannata, Anaarkali of Aarah, and Veere Di Wedding. 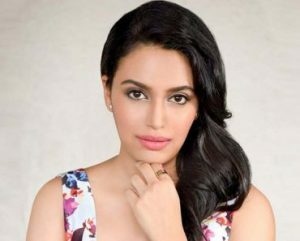 Born Swara Bhaskar Chitrapu on April 9, 1988 in Delhi, India, to Ira and Chitrapu Uday Bhaskar, she has one brother named Ishaan. She completed her schooling from Sardar Patel Vidyalaya in Delhi, and earned her bachelor’s degree in English literature from the University of Delhi. She enrolled at Jawaharlal Nehru University in Delhi to study Sociology. She made her film debut with a supporting role in the drama Madholal Keep Walking in 2009. *She was born in Delhi, India on April 9, 1988. *Her father is Naval officer Chitrapu Uday Bhaskar. *She studied Sociology at Jawaharlal Nehru University, Delhi. *She is friends with actress Sonam Kapoor. *She had faced severe backlash for her masturbation scene in her film ‘Veere Di Wedding’.